Please help me welcome Alexis from Reflections of a Bookaholic! I want to thank her for contributing a guest review. If you haven’t checked out her blog, please make sure you drop by. Also, be sure to check out her weekly Wednesday feature, Why I Love Wednesdays. But Rizzoli isn’t counting on the U.S. government’s sudden interest. Or on meeting Special Agent Gabriel Dean, who knows more than he will tell. Most of all, she isn’t counting on becoming a target herself, once Hoyt is suddenly free, joining his mysterious blood brother in a vicious vendetta. Jane Rizzoli is still trying to get over her run-in with The Surgeon and she hopes that the nightmares will one day stop. But when she starts to see similarities between a new serial-killer and The Surgeon the nightmares come back full force. Is she going to ever get over her experience and be able to do her job? 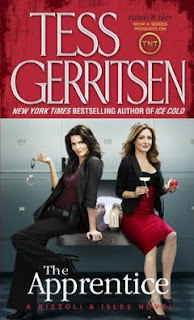 Special Agent Gabriel Dean is not sharing why the FBI is involved in the newest serial killer case, but he definitely has thoughts on whether Rizzoli can do her job. Just when Rizzoli doesn’t think things can get any worse, it does. This is quite an interesting read. I didn’t read the first book in the series because my online library didn’t have it. But I didn’t feel like I had missed out on too much. Rizzoli has a chip on her shoulder the size of Texas, which doesn’t exactly make her a likeable character. I kept wishing she would just chill just a little bit. Agent Dean wasn’t my favorite but I don’t think he is supposed to be. The analysis and explorations of the cases were amazing. The writing was technical without being boring. Think CSI but in writing and much cooler. I will admit that some of it went over my head but it didn’t happen too often. I was confused at why Maura Isles was featured so prominently on the cover. She makes an appearance in the book, but not as much as I expected (considering she made the cover). Fab-tastic writing and I never knew what to expect. I recommend this one for those who like Mystery/Thrillers with forensic details. Oh and I wouldn’t read this is you are sensitive to blood and gore. It can be kind of graphic. I found out it was TV series as I was finishing the book. I’ve set my DVR and I’ll be putting Book #3 in my queue. Lovely review Alexis! Thanks for guest reviewing. I love mystery/thrillers and am always glued to my tv when NCIS or Forensic Files is on, so this sounds really similar. I actually saw the first couple episodes of this show with my Mom. I might have to catch back up on it soon. I have to say I really like the sound of this book! I’ll have to look up the first one though, to see how that looks, or I might just try to jump to this one as well. I’m glad you liked it! And I had no idea it was a TV series either… But now when you mention it, I might have heard of it. Sounds totally fun! Great review! I think I’ll look for this one T.V. too. Thanks for the review Alexis. That is definitely one gigantic chip she got if its as big as Texas, lol. Nice review. I definitely like mysteries and thrillers. I have seen a few of the episodes. Like your guest review feature Jade. Thanks for allowing me to guest review Jade. I did recently watch the show and I didn’t really care for it. I think the book is better (isn’t it always). Awesome review, Alexis! I wonder how the book compares to the show! The description of these books remind me of Kathy Reich’s books. I saw the tv show once or twice and liked it, but I keep missing it. Thanks for the great review.